Archos develops Smart Home control system for smartphone and tablet | What Hi-Fi? Archos has announced its Smart Home kit which teams up with your smartphone and tablet to enhance home connectivity. A smart plug, when combined with the Smart Home app, allows the user to control an attached electronic device, so making some of life's everyday tasks easier. Users could, for example, manage their TV, fridge or houselights from their smartphone or tablet. At the centre of the Connected Home is the Archos Smart Home Tablet. This controls the connected objects and can be tied to the Smart Home application on any Android and iOS device allowing users to take control from anywhere with an internet connection. 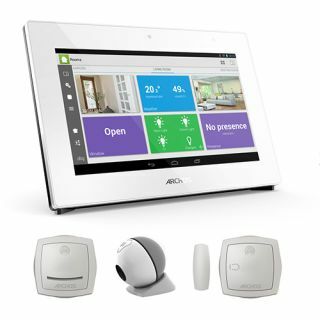 The Archos Smart Home starter pack includes the Smart Home tablet to manage the connected objects, two Mini Cams to take pictures, two Movement Tags to detect movement and door openings, and two Weather Tags to measure temperature and humidity. This starter kit is now available for £200 and its connected objects are also available as stand-alone products starting at at £30. Other connected objects will be available during the summer. All Smart Home objects are connected by bluetooth allowing them to be completely wireless, and all of the connected objects (excluding Tablet and Plug) are weatherproof. Battery life is claimed to be up to a year making these nicely low-maintenance. The Smart Home tablet has a standard 7in display, comes stock with Android 4.2.2 "Jelly Bean" and has a 5 MP front camera. It runs on a 1.2GHz dual-core processor. The Mini Cam supports a 110 degree viewing angle. It has bluetooth connectivity, is waterproof and weighs 50g. The Motion Ball detects motion up to 10 meters away, it has bluetooth connectivity, and a 110 degree viewing angle. It is also waterproof and weighs 49g. The Weather and Movement Tags support bluetooth connectivity, are waterproof and both weigh 16g. The Smart Plug (also compatible in France and Germany) has bluetooth connectivity and weighs 56.7g.